Looking for a new car that makes a statement without breaking the bank? Come into Northeastern Texas's preferred Dodge dealership—Greenville Chrysler Dodge Jeep Ram—for a test drive of the super smooth 2015 Dodge Dart. Thanks to unique styling, well-trusted reviewers like Kelley Blue Book (online) are calling the 2015 Dodge Dart one of the best-looking cars in its competitive class. 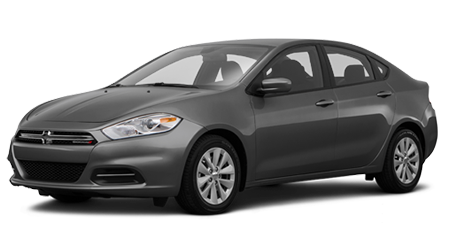 Powerful, attractive, fuel-efficient, and well equipped at even base levels, the 2015 Dodge Dart is an irresistible sedan well worth the look. The newest Dodge Dart sports a cavernous interior that's big on legroom—no matter where you find yourself sitting—and a thoughtful layout ensures that every seat is as comfortable as the next. Soft-touch interior elements and premium packaging allow you to configure your new Dart to fit your needs and desires, and inventive storage spaces like a large glove box and center console give you protective places to store your smart devices and other valuable necessities. There's also a "floating" island dash, standard with the Aero, Limited, and Dodge Dart DT models. Optional features range from a technology pack that includes blind spot monitoring assistance, rear parking assistance, satellite radio, and navigation, to sport tuned suspension systems, and luxurious Nappa leather. Three finely tuned engines are offered with the newest Dart. The first is a 2.0-liter inline-four mated to a 6-speed transmission (automatic or manual—it's up to you), just like all other engine offerings. This base engine returns 160 horsepower and 148 pound feet of torque. The second 1.4-liter engine has been turbocharged for your enjoyment, and nets the same amount of horsepower but 184 horsepower for added propulsion. Meanwhile, the 2015 Dodge Dart SXT, GT, and Limited feature a wildly muscular 2.4-liter Tigershark heartbeat, is available as PZEV, and comes with the same option to be either manually or automatically controlled. Whether you live in Greenville, or the surrounding Rockwall, Farmersville, Commerce or Garland communities, a great deal on a great new car is within reach at Greenville Chrysler Dodge Jeep Ram, so come on into our Greenville, TX dealership and showroom today for more information on the 2015 Dart or any of our other exceptional new and used cars, trucks, and SUVs!